Nothing says “tis the season” quite like a festive bite (or two…). From sweet treats to savory snacks to DIY cookies perfect for your clients, customers and their families, these holiday favorites ring in the season in a big way – and, this year, we’re counting down the days until we can whip up a batch, crack open a tin and sink our teeth in. This holiday season, we’re starting with a few classic faves, adding in some new must-eats and sprinkling in some super festive snacks and sips we can’t get enough of. As you’re making your list and checking it twice, start here. Brand these fun, festive holiday food gifts and make a serious seasonal statement. Think s’mores are only for camping trips? Think again. These Gable Box Kits are perfect for holiday gifting. Want to go big? These larger kits come complete with everything you need to make three full-size s’mores. Everyone loves a stainless-steel tumbler – but, as the holidays roll in, everyone especially loves a tumbler topped off with some festive hot cocoa. This Ghirardelli® Cocoa Kit is the best of both worlds, with a custom tumbler that keeps cocoa, coffee or tea hot, and their famous double chocolate cocoa. Another perfect pick? This LEEMAN® NYC Tuscany set includes cocoa, two cups and a sleek faux leather-bound journal perfect for making those naughty and nice lists. Want to go cup-less? Fun and festive, Hot Chocolate on a Spoon is it. Each spoon features a delicious Belgian chocolate square topped with mini marshmallows, all packaged for holiday gifting. Simply stir into a cup of hot water or milk for an instant cup of hot cocoa and marshmallows. An alternative to the spoon? These all-in-one cups – simply add hot water, stir and sip. Speaking of mixing it up, this branded Chocolate Chip Cookie Mix is the perfect gift for the baker or non-baker on your list. Not only does this mix deliver the perfect “a little bit chewy/a little bit crispy” cookies every time, but it only require two ingredients (butter and an egg – easy!) to complete. Another DIY fave is this new classic – make-your-own chocolate-covered pretzel rods. As easy to perfect as the cookies, these pretzels are destined to become a seasonal must-have around your office. Simply melt the chocolate, dip a pretzel and top with a favorite candy – or candies. 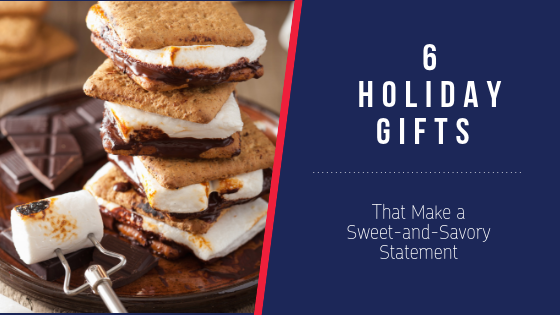 It’s all included – everything your clients and customers need to make a sweet and salty holiday treat. Want to really wow recipients? These towers, tins, totes and crates are the perfect place to start. 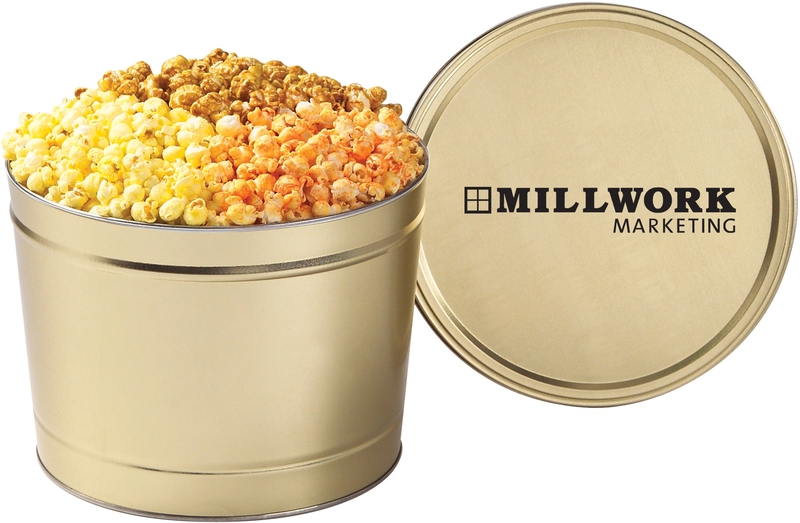 Two gallon popcorn tins contain three seasonal favorites – butter, cheddar and caramel. Sink into these gourmet kernels and you’ll never go back to regular popcorn – trust us. Want popcorn – and then some? We don’t blame you. And that’s why this Gourmet Treats Custom Gift Tote is a holiday classic and a popular choice in the “off-season.” Not only is this tote packed with everyone’s favorites – lemon cookies, berry and fruit nut mix, peanut crunch, butter toffee caramels and, yes, that amazing caramel popcorn, but the branded tote is the perfect carry-all once the snacks run out. If you’re all about the cookies, this jam-packed crate of crisps and cookies is the way to go. 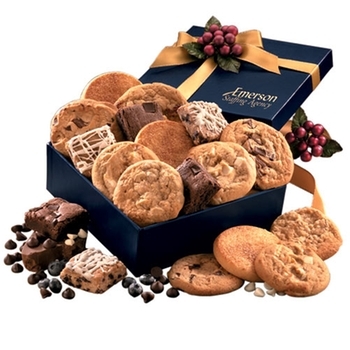 With classic seasonal flavors including chocolate, lemon meringue, snickerdoodle, mixed berry, cranberry shortbread and, of course, chocolate chip, this oversized cookie delivery will keep your clients and customers snacking all season – and thinking of you with every bite. And if it’s all about making the ultimate snacking statement, this is it: the Gourmet Snacks Gift Box Tower – yes, tower. This four-tier tower is overflowing with tons of treats perfect for every palate – think lemon cookies, honey mustard pretzel nuggets, peanut brittle crunch, shortbread, chocolate-covered almonds, wafer cookies and more. Tie it all up with a custom ribbon and your tower is good to go – and sure to be the favorite gift this season. We’ve rounded up even more amazing holiday food gifts here. Have questions? Get in touch to discuss your holiday gift order now! We’ll just come right out and say it: This is THE BEST popcorn we’ve ever had. Ever. Ever. Even popping the lid on the 3-Way Gourmet Popcorn tin (which, BTW, has two gallons of popcorn in it) is enough to push taste buds into overdrive. And, no, it’s not an exaggeration. 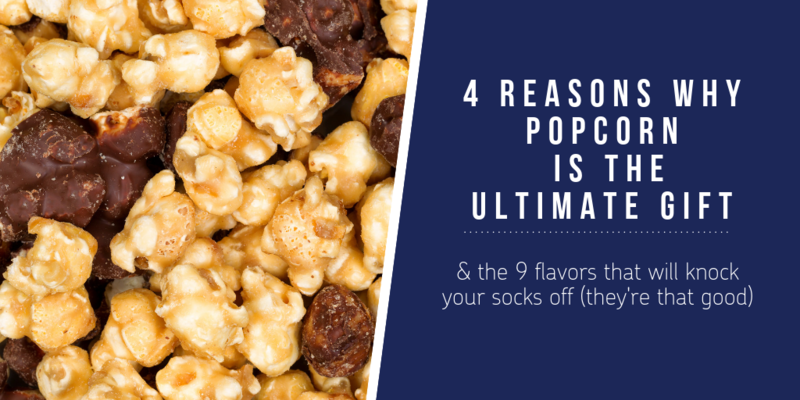 Because this is the exact same popcorn which flies off the shelves at luxury retailers and gourmet grocers. This is THE popcorn – the popcorn that will spoil you and your clients for all other popcorns – F-o-r-e-v-e-r. This is the popcorn you want as your corporate holiday gift – provided you can snag enough bags before the seasonal crush. Our goal? Work through all nine flavors – which shouldn’t be too difficult. Do yourself and your clients a favor and opt for a few different flavor combos if you don’t go for the tin. This will allow you and your recipients to mix, match and find their ideal snack mix. There’s just something about the salty/sweet combo that we can’t get enough of. The 3-Way tin is a slam dunk on that front, with two savory and one sweet option built in. But, with these smaller-sized custom gift bags, it’s easy to send a savory/sweet combo pack to a client. Some of our go-tos? Cheddar + Kettle Corn and White & Dark Chocolate + White Cheddar Truffle, for starters. We also love Cookies & Cream + Peanut Butter Cup. Yes, it’s more sweet + sweet, but the peanut butter gives it just enough salt to satisfy the cravings. In a word, YUM. The tin is perfect for sharing – or not. But the custom gift bags are a great desk-side snack. 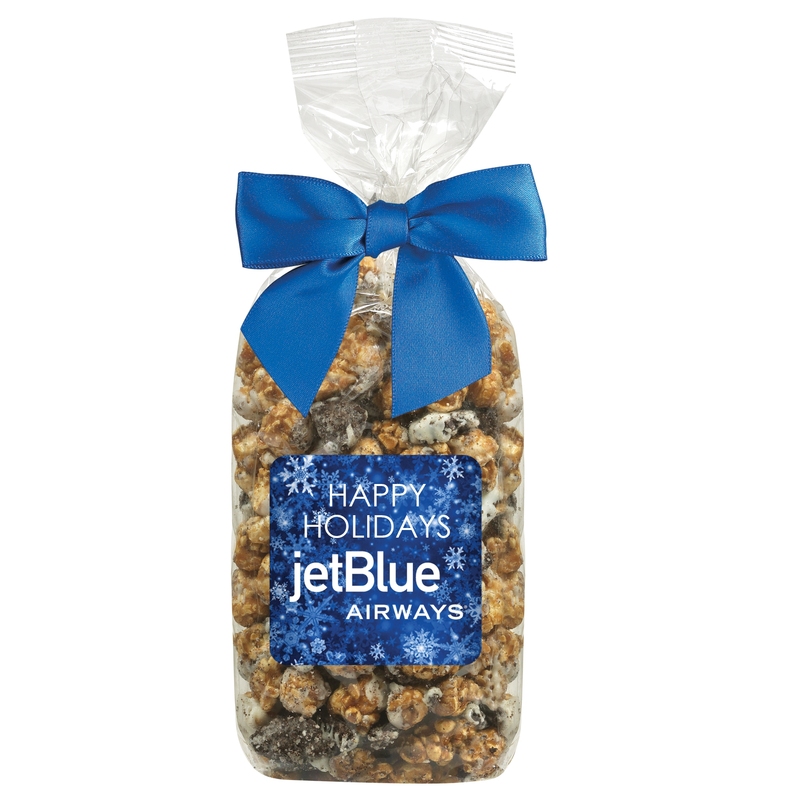 Unwrap the ribbon and you’ve got just over two ounces of amazing gourmet popcorn at your fingertips – literally. It’s great for a post-lunch snack, great to bring to meetings and events as a “thank you” and great for those long road trips, plane trips and train trips during the holiday season. In other words, these popcorn packs will be a welcome holiday addition for your clients, scoring you tons of brownie points – or should we say “popcorn points” – all year long. Do yourself a favor and grab a free sample or two, then get your orders in ASAP. 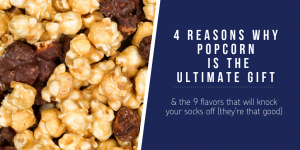 There’s a reason luxury retailers and boutique grocers opt for this gourmet popcorn. Grab a bag and you’ll see why. Food gifts are universally loved! According to Nation’s Business Magazine, food gifts are the best business gifts for the holidays because they are something everyone can enjoy. Most business gift buyers know that it can be a struggle to find a gift that will make everyone happy. With food gifts, this is rarely an issue! They have a broad appeal and can satisfy audiences young and old, male or female. Everyone loves logo imprinted cookies. Corporate food gifts are affordable. According to American Express Small Business Services, 50% of business gifts that are purchased for the holidays are food gifts. This isn’t only because they are well-received, but because they don’t cost a fortune and have high perceived values. Some corporate food gifts can cost less than $2-3 each – an attractive price point that lets you thank or reward large audiences for less money. Plus, there are plenty of discounts and deals to be found around this time of the year as gift demand begins to skyrocket. Promotional food gifts can be easily customized. Forget picking up your food gifts at the grocery store, expensive bakeries, or online retailers. When you purchase your food gifts from your promotional products distributor, you have the option of customizing the gift’s packaging to represent your brand. Many food items include optional gift cards that can be personalized for each of your individual recipients. These gifts offer a lot of freedom to be creative, so take full advantage of these opportunities.